ClydeSights: It must be summer . . .
. . . if for no other reason, the preserved paddle steamer WAVERLEY is still sailing on the Clyde. 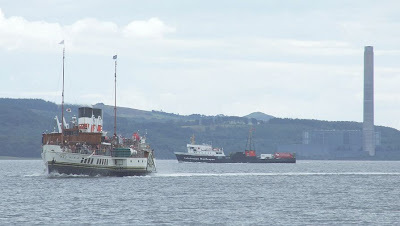 This picture shows her on her usual Wednesday cruise from Ayr to Carrick Castle, which has been a feature of her summer schedule for a number of years. Meantime, Caledonian MacBrayne's car ferry JUPITER passes astern of the paddler on another of her regular sailings from Dunoon to Gourock. The future of this subsidised service has yet to be decided by the politicians at Holyrood following the failure last November to entice an operator to run the service on a purely commercial basis.